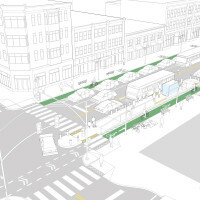 While stop location determines to a large extent how transit vehicles approach stops and interact with traffic, the physical configuration of stops and stations impact how riders interact with the transit system. 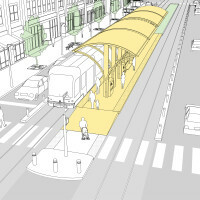 Transit stops play a significant role in the urban street puzzle, and can be used not only to provide comfortable and accessible transit access, but also to organize traffic interactions and manage curbside activity. 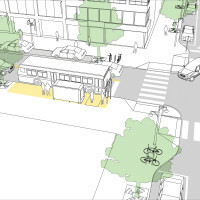 The manner in which the transit stop is integrated into the streetscape determines its ability to bolster transit operations, serve street users, and activate underutilized space. 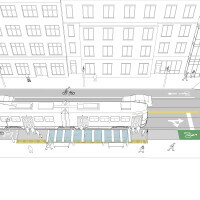 Boarding bulb stops use curb extensions to enable side-running transit vehicles to stop in lane, improving transit speed and reliability, and creating space for waiting passengers, furnishings, and other amenities. Side boarding islands are dedicated boarding areas for passengers that eliminate bike-transit conflicts, streamline service by enabling in-lane stops, and improve accessibility with level or near-level boarding platforms. 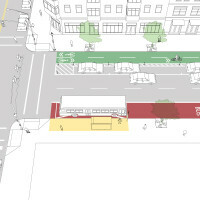 Curbside pull-out stops are a low-cost option for bus stops on streets with curbside parking. 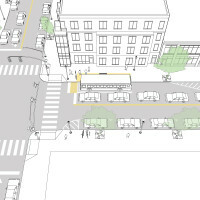 While bus transition time is longer than for in-lane designs, it is relatively easy to make these stops accessible, provided sidewalks are sufficiently wide. Where transit vehicles run adjacent to the curb, passengers board and alight directly from the sidewalk. Curbside stops are also often observed in dedicated transit lanes, where pulling out of traffic is unnecessary. 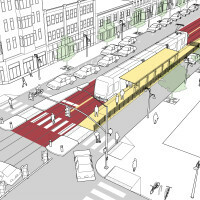 In-street boarding islands create in-lane stops, giving streetcars and buses priority within the street while allocating space for through-moving vehicles. 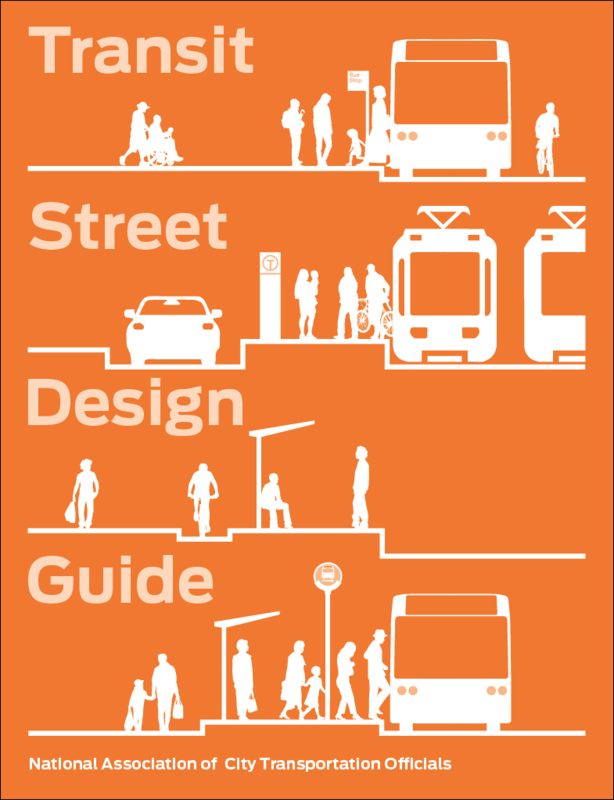 In-street islands call for careful accommodation and management of pedestrian access to the boarding platform. Where transit runs along a wide median separating travel directions, center-median stops highlight and give brand identity to transit service. 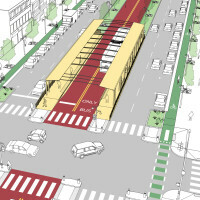 Right-side boarding platforms are interoperable with standard buses and higher capacity transit vehicles. 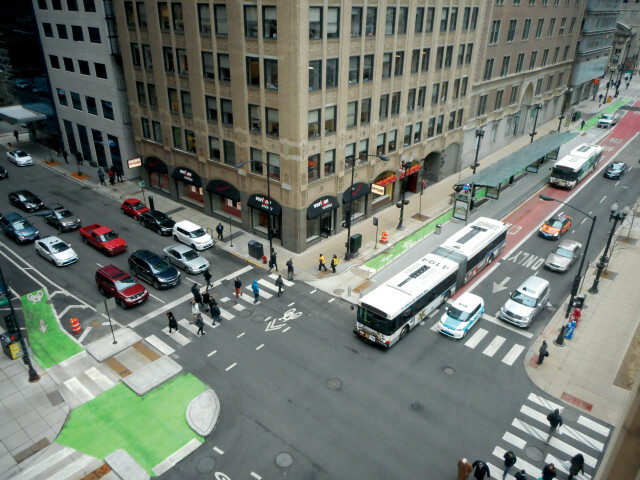 Center-median stops and stations offer the highest level of comfort and visibility for high-frequency and high-volume transit routes. Combined platforms deliver efficient service, with passengers boarding through doors on the left side of transit vehicles. On-street terminals serving many routes can increase capacity and reduce transit vehicle congestion where multiple routes converge. 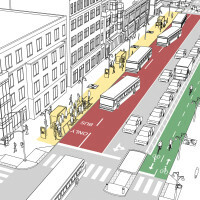 By grouping routes and spacing stops in a skip-stop configuration, passenger boardings can be dispersed, easing pedestrian congestion. References for Stop Configurations: 1 found. KFH Group, Inc.. "Guidelines for the Design and Placement of Transit Stops for the Washington Metropolitan Area Transit Authority." Washington Metropolitan Area Transit Authority, Bethesda, MD.